Evelyn Rhoades would prefer to ignore the fact that she is turning thirty-five and moving out of the young 18-34 demographic and into the older 35 and older group. Unfortunately, her colleagues and staff at the Bell Harbor Plastic Surgery Center won’t let her forget. They throw her a surprise party complete with a rhinestone tiara (slightly tarnished), glitter bombs, calorie-laden cake, and unsubtle suggestions that her birthday wish should be for a man in her life. Evelyn is almost thankful when she is called to the emergency room to stitch a facial wound in the face of Tyler Connelly who has mixed alcohol with a ride on a stolen jet ski with disastrous consequences. It’s not every day that Evie is called to work on the face of a patient whose face is model-perfect and whose body makes her uncomfortably aware of her prolonged celibacy. Nor is it every day that she takes final stitches to the accompaniment of her patient’s being Mirandized by arresting officers. As if her birthday had not been memorable enough already, during dinner with her parents, her mother, who has not mentioned men to Evelyn since she advised a fifteen-year-old Evie to avoid penises, expresses concern about Evie’s manless state. Her parents toxic marriage, which ended more than twenty years ago in an acrimonious divorce followed by decades of undiminished acrimony, has contributed to Evie’s disillusionment with the happily-ever-after image, so Evie is astonished that her mother is urging her to find “someone special.” Then, she is blindsided by her mother’s update on her own romantic status: she and Evie’s father are engaged and planning to be remarried on the date of their original wedding. When fantasies of Tyler Connelly continue to invade Evie’s mind, she decides it’s time she started dating—not Tyler, who is eight years her junior, menially employed, and an alleged felon, but someone more her type. Logical Evie makes a logical list of requirements for the man in her life. He must have an advanced degree in science, mathematics, or engineering; he must be her economic equal; he must be “civically aware.” But neither her logic nor the matches from the dating service can erase thoughts of the totally unsuitable Tyler. Evie finds herself following the dictates of her body and her heart, and Tyler in the flesh proves better than any fantasy. But real life Tyler also has baggage of his own, and the differences between them are still there. Can these two find their way to their HEA? 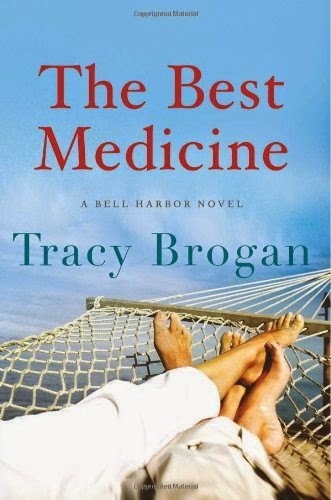 The Best Medicine is the second book in Tracy Brogan’s Bell Harbor series. Since I thoroughly enjoyed the first book in the series, Crazy Little Thing, I expected to like this one. By the time I read the first sentence, I knew my expectation would be met: "Birthday parties, in my opinion, are a lot like pelvic exams--a little uncomfortable, a little awkward, a little too personal, but an unavoidable yearly nuisance--like a pap smear, only with presents." I settled in to read, prepared for more laugh-evoking lines, and they were present in abundance. Evie Rhoades is intelligent, funny, and flawed—all qualities I appreciate in a heroine. While it is not essential for me to like the heroine to find a book worth reading, I do need to connect with the heroine on some level, particularly in a first person narrative like this one. I found Evie delightful. I admired her achievements, applauded her independence, understood her weaknesses, and appreciated her sarcasm and self-deprecating humor. Some readers may detect some snobbishness, but I thought her reservations about a relationship with Tyler because of the age difference and the gap in their educational and income levels sensible. Tyler is a dream. Not only are his face and body fantasy fuel, but he is responsible, unselfish, and hard-working. Plus, he likes dogs, has a sense of humor, and possesses caretaking, nurturing skills of a heart-melting level. He may be the only hero in romance fiction who practices his dragon slayer skills buying popsicles, toilet paper, and tampons for a girlfriend who is too sick to go to the grocery store. Brogan saves him from bland perfection by giving him some heavy family baggage, a few insecurities, and pride enough to create a problem. Bell Harbor is an appealing setting, and Brogan provides an amusing cast of secondary characters. I particularly like that the relationship between Evie’s parents and the relationships of her friends Hillary and Gabby and their significant others give a range of views of male-female relationships. I hope Brogan has further plans for Gabby. If you like Kristan Higgins, I recommend The Best Medicine. Brogan gives readers the humor, the family dynamics, the memorable H/H, and even the doggy character that have made Higgins a favorite with so many romance readers. The Best Medicine is a no-fail prescription for lots of laughter, characters you will root for, and a central love story that truly is contemporary and romance. Sounds wonderful, just what i need. Thanks, Janga! I have this one on my beach reading list. Now, after reading your review, I'm even more excited to dive in! Oh, this one sounds good! Your Kristan Higgins reference is enough to win me over! Thank you for the review. This sounds like it will be a fun read, perfect for the summer.